"Living The Experience" is a spiritual interactive Underground Railroad reenactment presented by Bethel Harambee Historical Services, in Lancaster, Pennsylvania. Join us for a journey back to the time of the 1800's on the Underground Railroad. Learn the role of the AME Church, Africans (free and escaped), and abolitionists in the successful pursuit of freedom. We look forward to being your conductor. Also, enjoy an authentic 1800's complete meal after the presentation. A show specially tailored for school-age children and youth in grades 1-8 is also available. Performed each Saturday at 1:00 p.m.; weekdays on Tuesday, Thursday, and Friday. Individual and group rates are available. Call for show day and time availabilities: 1.800.510.5899, ext. 113, or e-mail at liveitbethel@aol.com. Join us on the web at www.bethelamelancaster.org or send for a free brochure: Bethel Harambee Historical Services, 512 E. Strawberry Street, Lancaster, Pennsylvania, 17602. 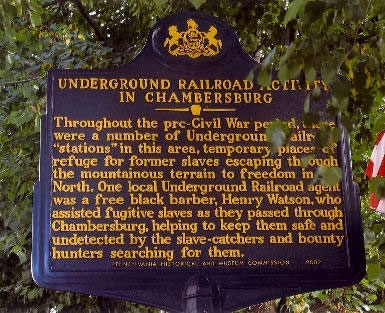 An Underground Rail Road Marker in Chambersburg, PA.